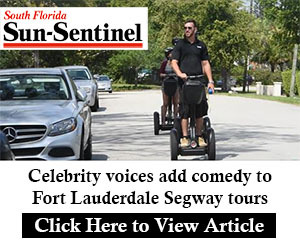 Click here to watch a trailer of your Segway Tour! Take a private Segway tour in Fort Lauderdale’s “Riverwalk”, a unique brick-paved pathway by the waterways carrying mega yachts, skyscrapers, and breath-taking scenery. Expect to see countless mansions and celebrity homes in the upscale residential areas. Choose to have your tour more laid back while just cruising around town, or more informative of the area and the history of the Segway. “Share” our Facebook page for free pictures! Reservations are available 7 days a week, every half hour from 7 a.m. until 11 p.m., and tours range from 5-10 miles in total. No balance, coordination, or experience needed, and top speed training is optional at key areas (12.5 mph). You will be provided with a helmet and expert training before the start of the tour. Our tour guides are highly qualified in training people on Segways all the way up to people in their 90’s! Check out our video to get a better feel for what to expect on your tour. Want to get “Mall Cop Certified”? Put in the request, and we will teach you not only how to ride the Segway, but also how the high-tech info key works. Fort Lauderdale is known for it’s sunny beaches and beautiful residential areas. Our highly trained tour guides will fill you in on the beautiful sights and the history of this very popular area in downtown Fort Lauderdale. You will find shops, restaurants, sidewalk cafes and entertainment venues up and down Ft. Lauderdale Beach. If it’s hot, we will stop for a cold beverage or maybe even some ice cream at the best shops in town! 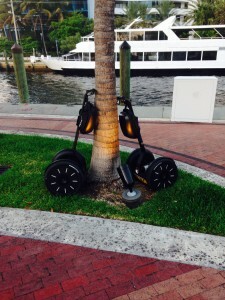 Take your Segway tour along side the Fort Lauderdale Riverwalk. Choose a day and time and expect nothing but one of the best experiences you can take in. 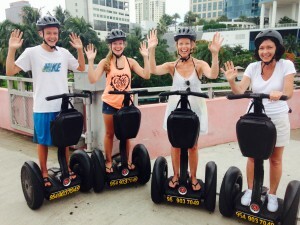 Choose Ultimate Florida Tours for your tour of Fort Lauderdale on one of our amazing segways! You will be trained until you feel comfortable on your Segway. Don’t be intimidated, you will be a Segway pro in the matter of minutes! Today, Fort Lauderdale Beach features an array of shops, restaurants, sidewalk cafes and entertainment venues. The area is home to the Las Olas Marina and Fort Lauderdale Aquatics Center, as well as numerous other special events. In addition the beach offers a wide range of activities including boating, wind surfing, jet skiing, volleyball, snorkeling, scuba diving, deep-sea fishing and rollerblading.